This picture may not be the most exciting I’ve ever posted, but the promise of a cup of Starbucks Reserve Guatamala de Flor makes up for it. This coffee wasn’t at the top of my Reserve tasting list because I’m not always a huge fan of central American coffees, but I shouldn’t have put it off. The Guatamala de Flor was one of the smoothest and most interesting coffees from the region that I’ve tasted to date (and certainly one of my favorites, though of course I can’t claim to recall every Guatemalan coffee I’ve tasted). I found it to be much more difficult to describe than some other coffees. Many coffees will come out and hit you over the head with bold, distinct berry and citrus notes. This coffee is a little different, because it is incredibly smooth and, while it is very complex, the flavors in it just seem to blend together seamlessly. It has a lovely herbal quality that reminds me a lot more of rooibos tea than it does of the sort of herbs that grow in your garden, with mild hints of citrus (no tartness, though) and even a hint of aged wood. It has a bright flavor and leaves a lingering, complex flavor in your mouth – much like a good Chardonnay. This is a medium roast, and like the lighterKenya Tana River Reserve coffee, this makes fantastic iced coffee. That tea-like herbaciousness makes it very refreshing, and the full flavor of the coffee comes through without a hint of bitterness. 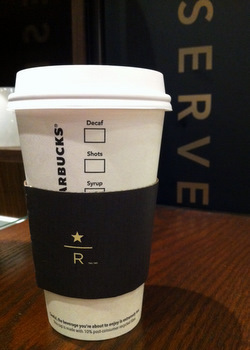 I should also add that not just one, but TWO Starbucks stores in my neighborhood now have Clovers and a fantastic selection of Starbucks Reserve coffees, so you can look forward to more Reserve reviews as more coffees are released. I know I’m looking forward to trying them!